Add 10 free Pampers Gifts to Grow points to your account with code FBLBR9AWDAYB3E3. This code is good through September 6, 2013. Add 10 points to your Pampers Gifts to Grow account with code FBTHX8DAJEL7R13. The code expires August 17, 2013. Add 15 points to Pampers Gifts to Grow account with coupon PAMPERSREWARDS1. Add 10 free points to your Pampers Gifts to Grow account when you use coupon code FBAPR4WSRE8WT13. This code is good through April 20, 2013. 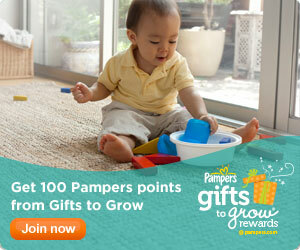 Add 10 free points to your Pampers Gifts to Grow account when you use coupon code SPRING2013MARCH. Add 5 free points to your Pampers Gifts to Grow account when you use coupon code LEAPTOSPRING313.